What Day Of The Week Is September 6? 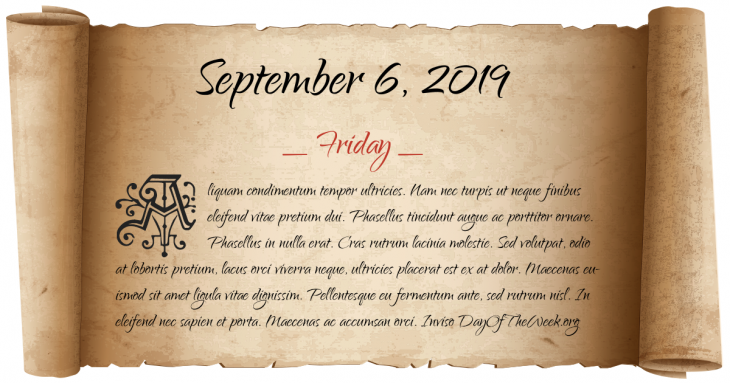 September 6, 2019 is the 249th day of the year 2019 in the Gregorian calendar. There are 116 days remaining until the end of the year. The day of the week is Friday. The Battle of Groton Heights takes place, resulting a British victory. Anarchist Leon Czolgosz shoots and fatally wounds US President William McKinley at the Pan-American Exposition in Buffalo, New York. Canada’s first television station, CBFT-TV, opens in Montreal. Two passenger jets bound from Europe to New York are simultaneously hijacked by Palestinian terrorist members of PFLP and taken to Dawson’s Field in Jordan. Munich Massacre: 9 Israel athletes taken hostage at the Munich Olympic Games by the Palestinian “Black September” terrorist group died (as did a German policeman) at the hands of the kidnappers during a failed rescue attempt. 2 other Israeli athletes are slain in the initial attack the previous day. Funeral of Diana, Princess of Wales takes place in London. Over a million people lined the streets and 2.5 billion watched around the world on television. Who were born on September 6?